I have for you today a manicure that’s inspired by the gorgeous birthday card lovely Aysh sent me in my surprise birthday package. I knew I would have to do a mani inspired by the card as soon as I saw it! It's so pretty and I loved the colours together. While planning this mani, I realised that my nail polish collection is getting rather large. I could think of 5 different slightly similar polishes in my collection that I could have used as the base colour xD It's a scary thought considering a year ago I was complaining that I didn't have enough polishes!! 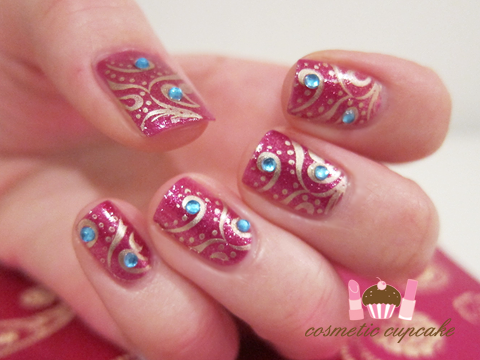 In the end I decided to go with a base of Art Deoo 280, some gold stamping and blue rhinestones to achieve the mani. I received Art Deco 280 from my wonderful friend Christina as a birthday gift and I’ve been dying to try it out since. I haven't really felt like these sorts of colours lately though which is why I didn't try it sooner. 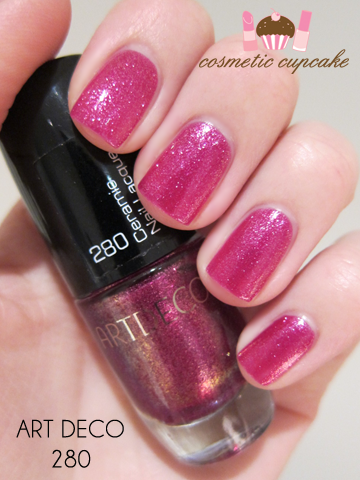 280 is a gorgeous dark magenta polish with fuchsia microglitter. In the bottle, it looks almost duochrome with some gold flashes but it doesn’t translate on the nail unfortunately. My swatches of it are a little lighter than it is in real life, the finished manicure pics show the colour of 280 more accurately. It was very easy to apply and the brush was fantastic to use. Pictured is 2 coats with no cleanup required and it dried quickly and to a glossy finish! I'm very impressed with this awesome Greek German brand (thanks for the info Marox79!!) =D The microglitter adds that something extra to the polish and makes it sparkle. I then stamped swirl and dot full nail design from Konad plate m64 using China Glaze Passion. I then applied some round light blue rhinestones (I don't have dark blue ones doh!) to my nails. Topped it all off with a coat of Color Club Vivid Color Intensifying topcoat! Thank you to Aysh for providing me with the inspiration for this mani and to Christina for helping me achieve it! What do you think of my mani? Does it look similar to the card? I love matching stuff! This is so gorgeous! I really love this! Beautiful and classy. One minor correction: Art Deco is a German brand, not a Greek one. It is sold at Douglas perfumeries in Europe. Wow it looks so neat and awesome I thought it was a nail sticker! Great job! HOW adorable! I love this color scheme. 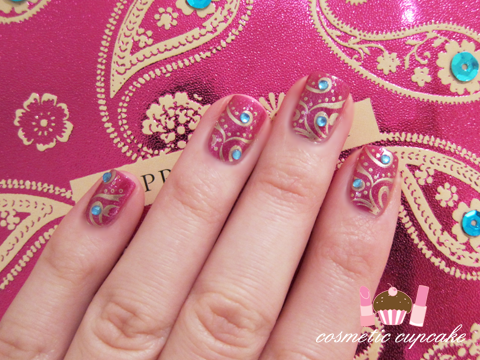 Love, love, LOVE this mani! If only I had the steady hand required to achieve this. Gorgeous! A perfect match, I love it! This looks awesome. :) Ah, some more great nail art. You've perfectly translated the design onto the nails!!! SUPER!!! This is perfect! I really love it! 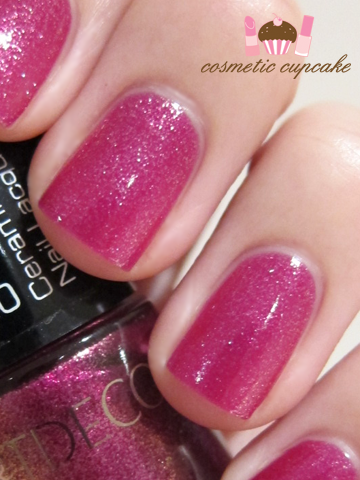 The mani is gorgeous as usual :) And I'm in love with the polish you used as base <3 It's soooo beautiful! Wow! That mani is unreal and absolutely AWESOME!!! This looks amazing. Great inspiration. you can get inspiration from anything, you are so creative! You did an amazing job! I LOVE this design! You did an amazing job taking the design from the card to the nail! Brilliant interpretation. I especially love that base colour. The bottle picture is so pretty, it's a shame the gold didn't show up. Such a pretty look! You paint your nails so perfectly! Oh my god that looks AMAZING!!!! I haven't forgotten about your package - just been SUPER busy. I'll be back in 2 minutes!!! Your mani looks GORGEOUS, lady! Oh my Chelle, this is so gorgeous! It looks like the card. You did a great job. I love it! omg i can't believe you did that! it looks INCREDIBLE and PERFECT! These are seriously amazing! I dont even understand how you can make your nails look this perfect! THANK YOU ladies for all the kind comments and love for this mani!! I can't believe you all like it so much but I'm so glad you do!! It was super fun doing it and even more fun rocking this mani. Expect more print inspired manicures in the future!